Ramblings of an Impatient Artist: Bombshell's Blog Hop - Stencil It In! 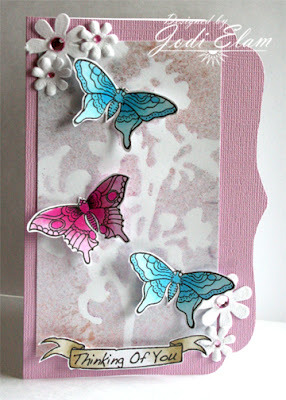 It's time to announce this month's Bombshell Stamps Blog Hop theme..."Stencil It In!" This month, We'd like like for you to use a stencil and your Bombshell stamps to create a project. Don't have any stencils? Create your own by free-hand cutting, die cutting, or punching an opening in cardstock or acetate and use the negative space as a stencil! Just look around your home...I'm sure you have all sorts of cool items that can be used as a stencil. I used a stencil by Tattered Angels and some Perfect Pearls Mists to create my background. I used the butterflies from the Butterfly Queen set and colored them with....you guessed it! Copics! Thanks for stopping by, now it's on the the lovely Ms. Alaine! Make sure you leave a comment to be entered for your chance to win this month's prize. Pink by Design - Spring! Wow. I love the soft look you got with your mists and stencil. The butterflies are just gorgeous! Jodi, this card is so pretty and reminds me of spring. I love your coloring on the butterflies, they look beautiful with the stencil you've chosen. Great work! Such a gorgeous, pretty card, Jodi. Love the softness you've created alongside those pretty butterflies. Thanks so much for sharing with us at Challenges 4 Everybody this time. visiting via MIM: Love the vibrancy of your card even though you have used soft tones and composition. Must get my stamps out to make some inky magic. Fabulous technique, looks wonderful as do those pretty butterflies. Thanks for linking up with Make It Monday this week.